Another SPV/Steamhammer re-issue for the American shore. 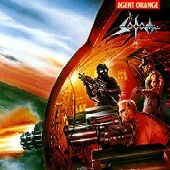 For a bit of detail on SODOM see my review of their "Best Of..." double CD elsewhere in this issue, but when it comes to looking into the SODOM back catalogue you can definitely put "Agent Orange" near the top of you list. This 1989 release was when the band was at the first pinnacle of its career and it is definitely a hallmark of the SODOM sound. I may be totally wrong on this but I suspect it was also the best selling album of SODOM's career as well. With the help of producer Harris Johns "Agent Orange" managed the crystal clear (yet still raw) production that SODOM desperately needs to get the full impact of their 1000 mph sound across.